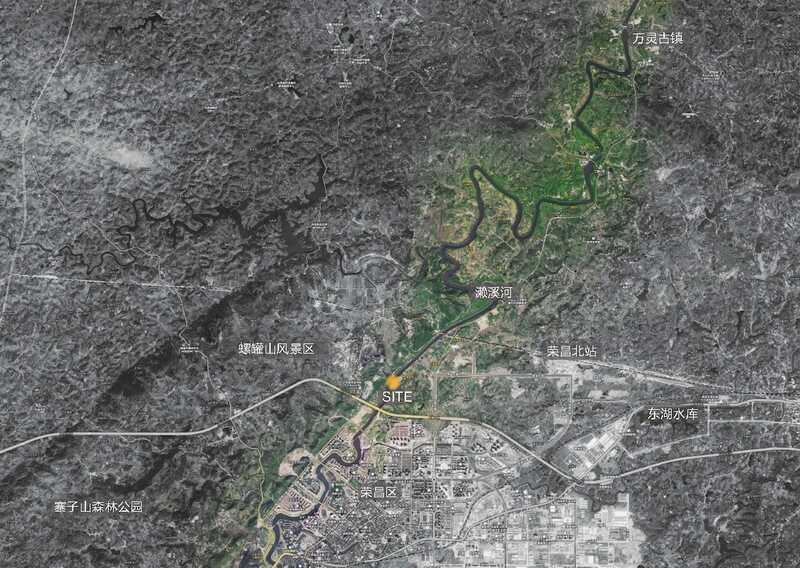 Thanks Tianhua Landscape for authorizing the publication of the project on mooool, Text description provided by Tianhua Landscape. Jinke China Image has good natural resources which the Rongchang mother River Tunxi River and the first riverside marathon track flow along the edge of the site. 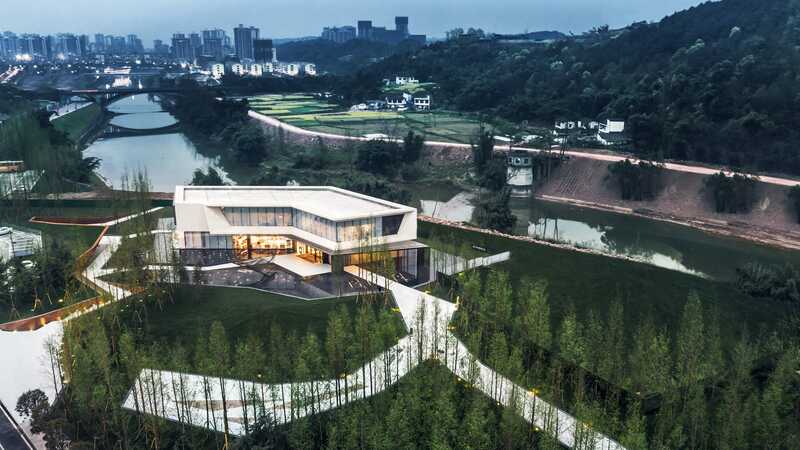 The steep mountains, the living water, the charm of the wetland park, and the delicately beauty of the Baili Promenade…How can we preserve the purity of this land, let the people in the city escape from the hustle and bustle, and pick up the natural memories so that they can be immersed in the field? This is the first question facing our design. 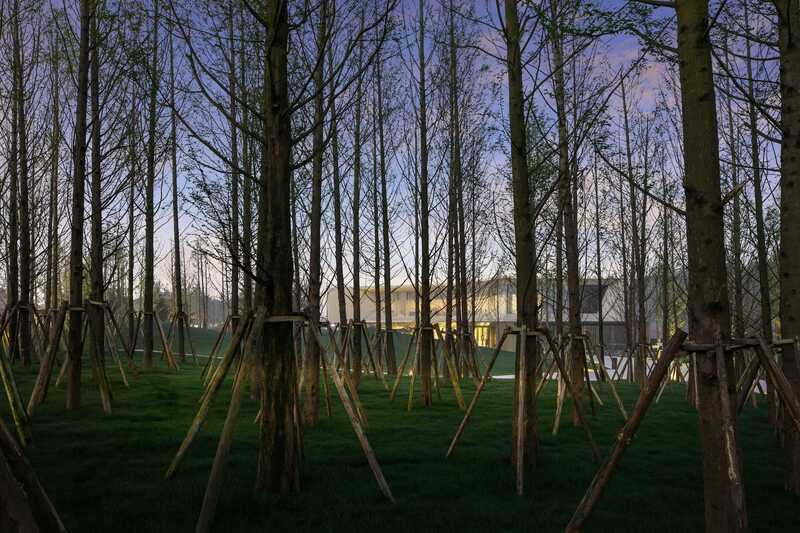 We believe that the form of this land should be respectful of the memory of the venue, simple, pure, low-key and blended with the beautiful natural scenery of the surrounding area. 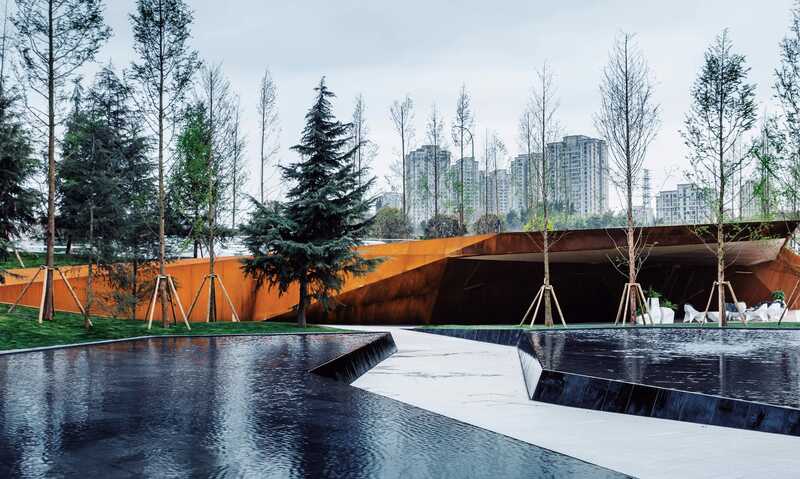 Such as, leaving a green eye full of view, hidding the traces of the artifacts, creating a corner surprise for those who walk in the space, and making people to explore and discover in the field step by step. 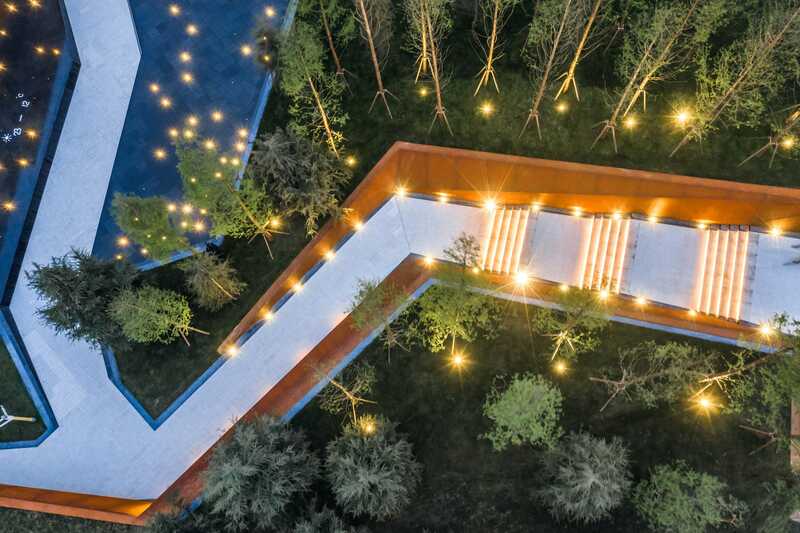 Through landscape design and simple materials, we transform a small area of the city and residence into a place with rich cultural and visual experience, using traditional elements to creatively combine the fragments of the past. The action we do here makes this area no longer be a hurried place through some design changes, but a place where people can feel strong touch. The natural terrain of the site descends from the east to the west by a height of more than four meters. 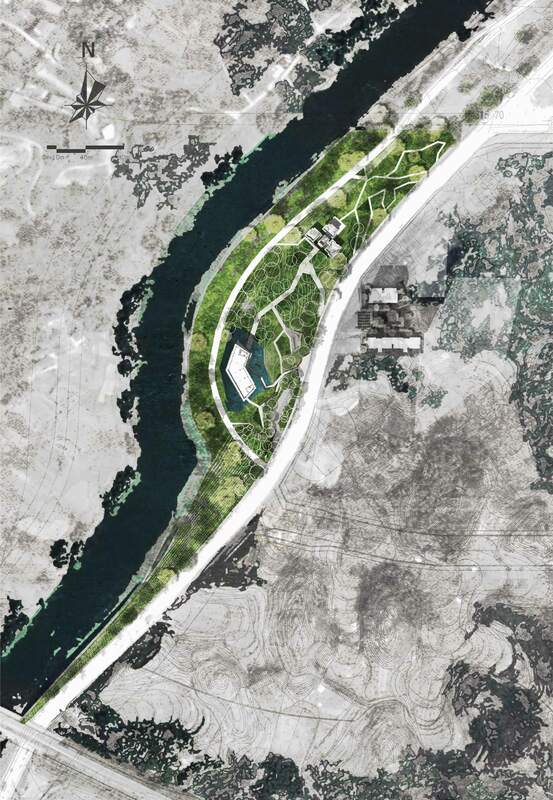 In order to maximize the shape of the site and obtain an unobstructed view of the river, the design cuts from the ground and creates a winding road. 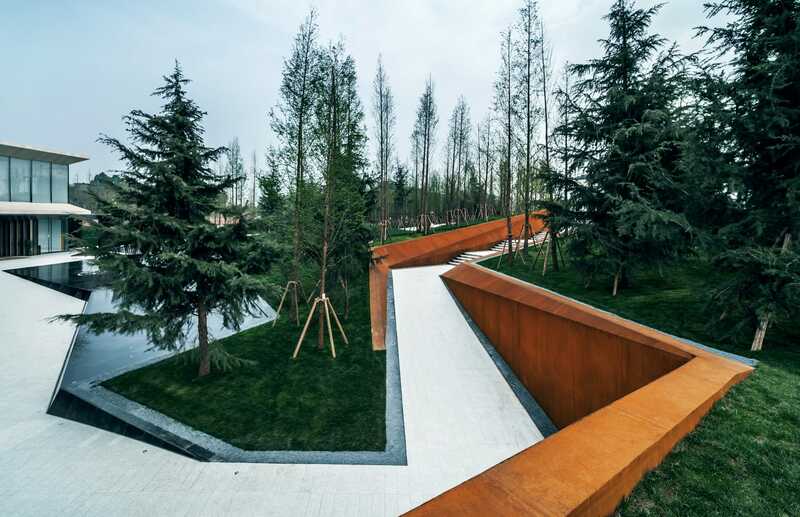 The retaining walls on both sides rise from the flat fold line shape to the turning façade shape, and then turn over to the upper layer of grass, wrapping all the artificial traces underneath with a natural skin. 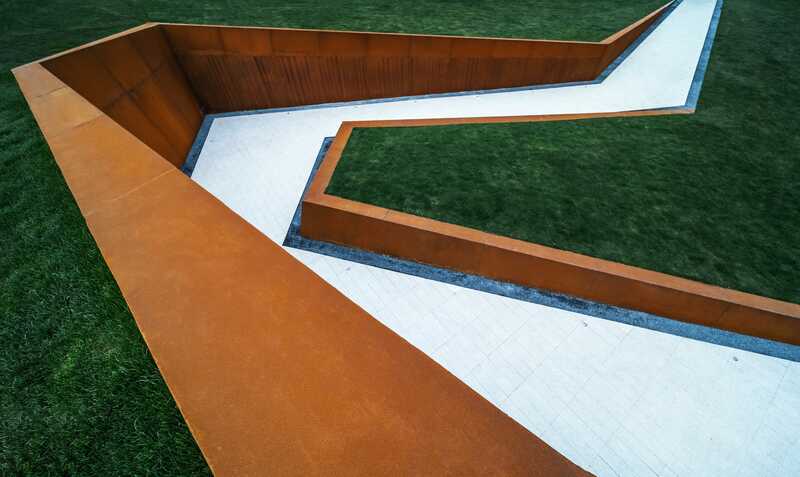 The lane space along the way uses weather-resistant steel sheets to record the changes in the years, allowing the entire site to change into the natural environment while changing the writing years. 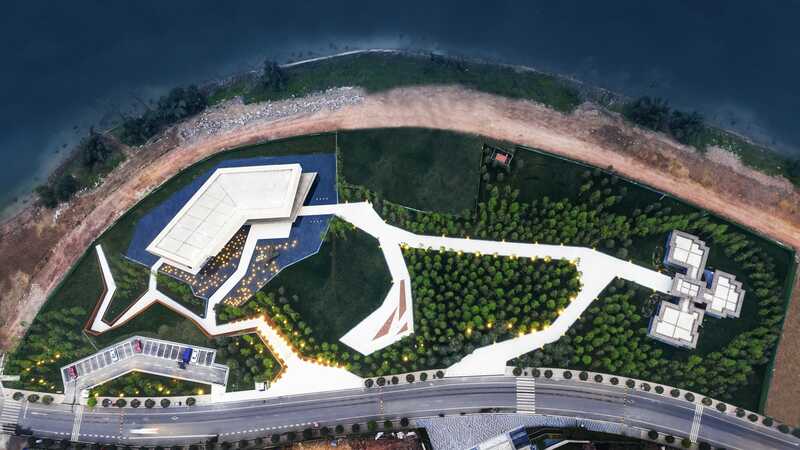 The sunken and turning road space will better introduce the regional wind direction into the venue, even in the summer, you can feel the cool. 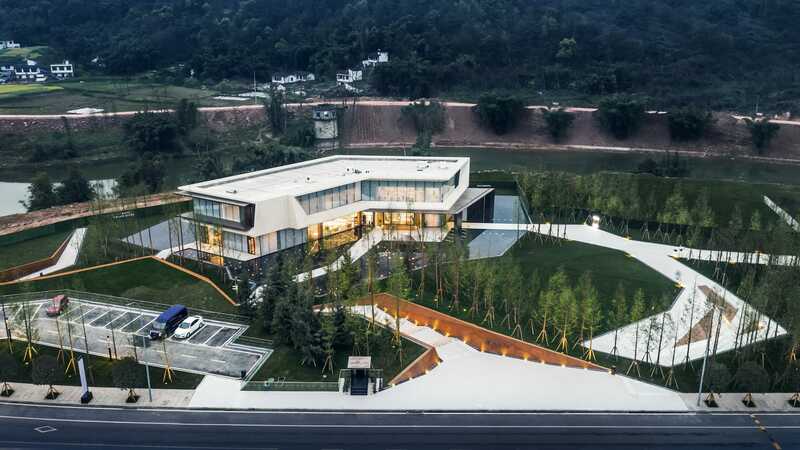 This project is not only a sales center, but also an art space. Between the heavens and the earth, it enjoys the floating environment between light and shadow. 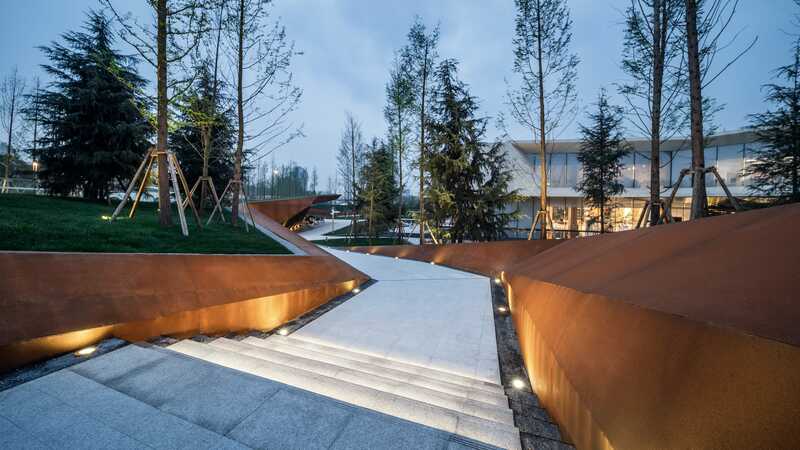 The main entrance landscape area has a one-piece physical relationship, a powerful and simple narrative moving line, has cutting out multiple scene experiences on a huge site scale, and becomes the visual and spiritual center of the sales center. 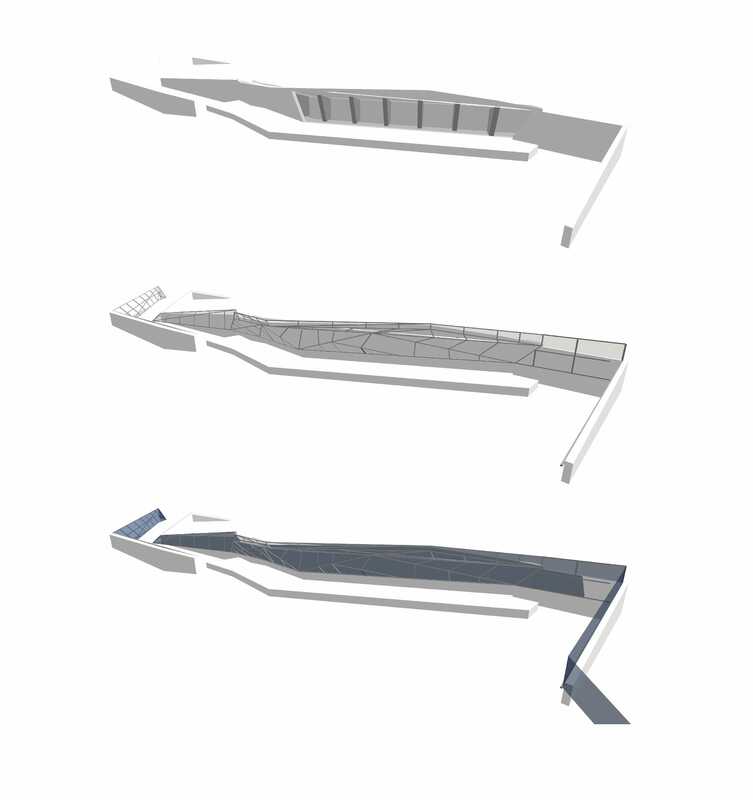 The main entrance of the irregular arrangement causes the light and shadow to form an irregular spatial sequence. The design extracts this sequence and records the memory of space and light and shadow. On the one hand, it is spatially associated with the external twists and turns of the Tunxi River. On the other hand, the space is cut and segmented, and the interconneced venue space are defined. 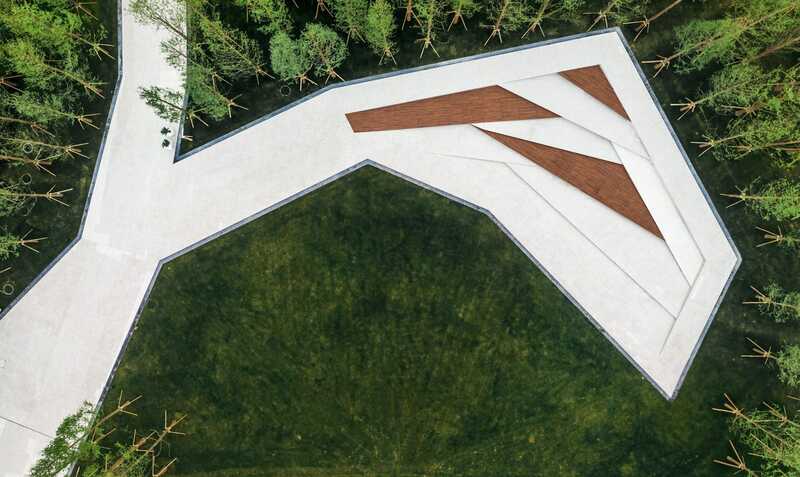 The designers use the height difference, using continuous fold lines and landscape micro-topography as a means to stitch the visual and spatial relationship between the outdoor living room and the venue, presenting the contradiction and harmony of heavy and light. The living room forms a spatial structure system through the structure and partial structure of the misaligned cantilevered part, so that each of the displaced upper and lower layers is a kind of gently placed tangent relationship instead of the traditional bite intersection relationship. This integrated design makes the function connection and the picture feel seamless. The sculpture in front of the waterfront of the sales center is the best form that has been formed after careful adjustments in scale. 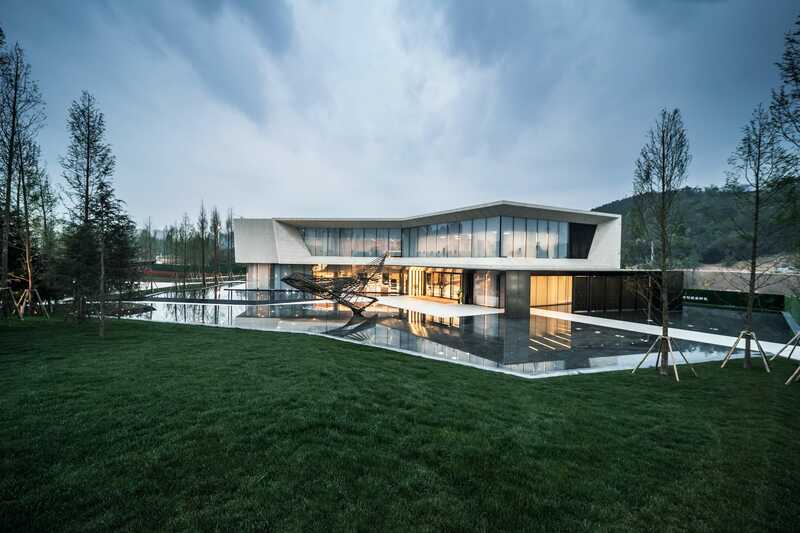 Its structure is gentle and elegant, and the simple art form is wrapped with intricate structural lines. 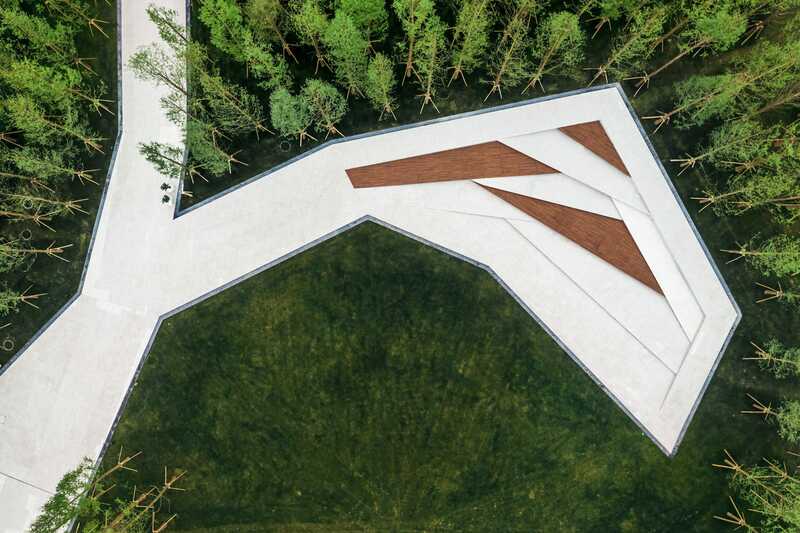 Its inspiration comes from nature, it is an abstract interpretation of natural movement and mobility, and it is the essence of the entire sales center. 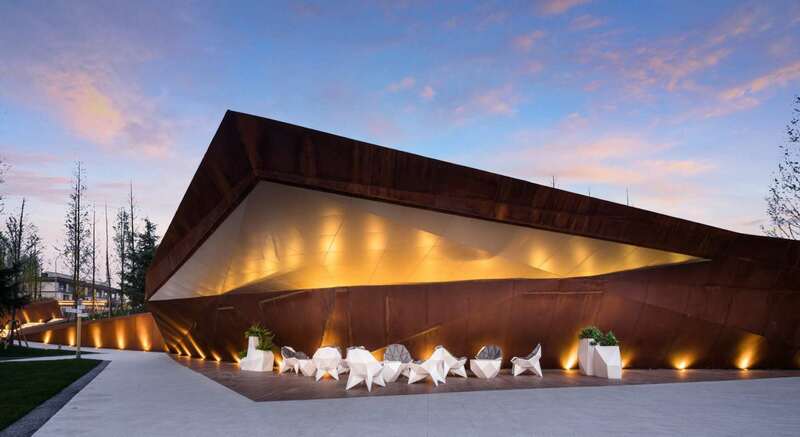 Its elegant and soft structure blends with the surrounding environment, which makes people think and enjoy. A few steps forward, it is an open sinking theater. 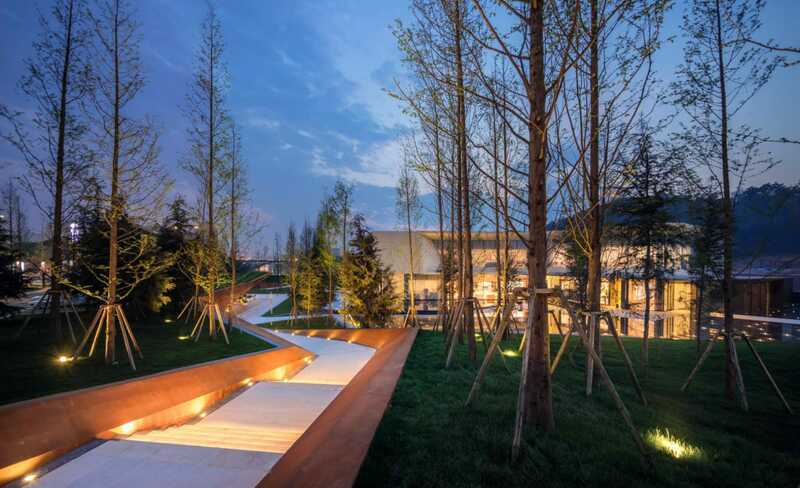 This is an extension of the outdoor space which with the open sun lawn as the main space, the pure Chinese fir and simple planting methods create a quiet green atmosphere, making the site look like a garden; combined with sparse forests and through different sinking seat and the swinging space of the use mode will make the original single sloping land vivid and vivid. While people enter, pass, stay, gather and other activities have their own place, connect the various spaces organically , and combine dynamics and statics to complement each other. Writing on the city, framing in life. Jinke Rongchang China Image, is the art of a fold line, is the art that runs through the night. The unintentional beauty moves the time. With the most succinct form, and the most respectful way of nature, resonate with you and me.